As the number of refugees and forced migrants continues to grow worldwide they have become a common topic in the news, but increased coverage has not meant improved coverage, according to refugees and refugee activists who spoke at “Our Stories, Our Voices: A Conversation with Refugees and Activists” at California State University — Northridge. What’s missing in the stories about the world’s 25 million refugees? Nuanced portrayals. A lot of reporting on refugees is “generic” says Sargon Saadi, a filmmaker from Syrian now based in Los Angeles. The further away from that sort of stereotypical reporting, the more effective your work will be, he suggests. This can mean including less flattering details about refugees. “Don’t make them super angelic. They also have negative sides, fears.” Including that information can create a truer portrait of refugees. The ordinary refugee/asylum seeker. The news media often sensationalize who is a refugee, disseminating the most dramatic stories when in reality refugees “may be people living next to us,” says Sandoval. “A street vendor may be escaping political persecution.” Avila agrees that reporters should focus on ordinary refugee, “the person who sells corn” on the sidewalk. Post-resettlement coverage. One of the most under-reported types of stories is that of refugees who are resettled and working to adapt to a new language, culture and environment, says Shammy Alkhattib of The Artist Mission which runs a child refugee art project in Southern California. While we often assume their challenges are over once they are “safe” in new countries, that’s not always the case. Children in particular may struggle to adjust and may face bullying when initially resettled. 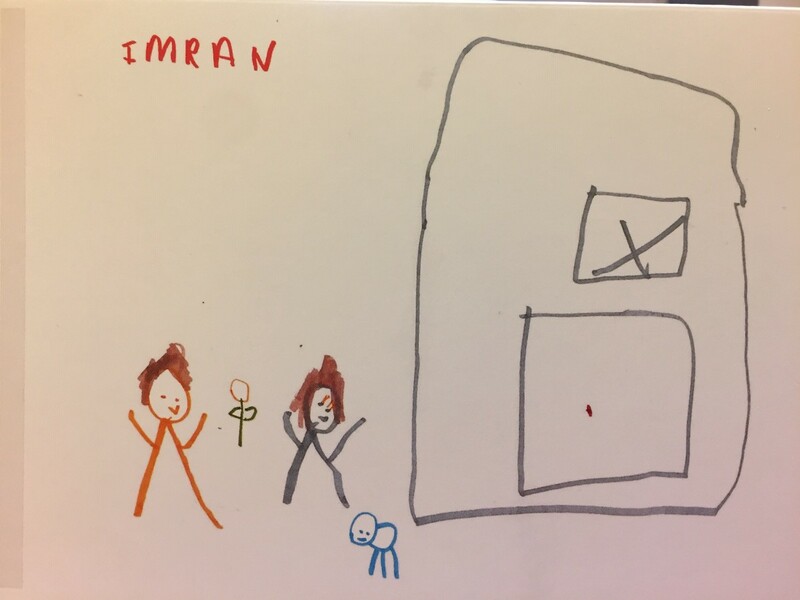 A child refugee’s drawing from The Artist Mission project. Alkhattib adds that media do not often focus on solutions stories for the resettled. Such reporting is less dramatic than covering caravans of refugees. Therefore, you “are not going to see that (solutions) on the front page,” Saadi says. Sandoval also suggests that refugees should be presented as survivors who show resilience rather than as victims. Duty of care. Alkhattib cautions journalists to protect refugee identities and also recommends that when interviewing those fleeing wars or other political violence not to ask which side they are on or who they support in the conflict. That information is often not necessary to the story and can cause them trauma or even potentially put them into danger if widely disseminated. Ultimately, coverage is determined by “who gets to tell the story,” says journalist Audrey Cleo, which is why having a diverse newsroom is so important.